Our Fun 101.3 radio station friends Dennis Mitchell and Michelle Cruz cruised into Yorgos casual Greek pub at the corner of N. Queen and W. Orange Streets just in time to beat yet another deluge of rain on Lancaster City in early fall. At the first floor bar, there was an after-work crowd, there were regulars and some folks Dennis and Michelle knew from Referral Partners Plus, a local business networking organization. Dennis and Michelle were greeted by owner George Katsaros and son/manager Tony with a traditional Greek appetizer Loukaneko, pork sausage seasoned with fennel, orange and dill served with warm pita wedges and a welcoming shot of Ouzo. Neither of our radio personalities knew that they would soon be escorted up to the second floor via elevator to Kefi at Yorgos Mediterranean Taverna, a cool retreat and a modern traditionalism dining adventure. They were ready to rediscover Yorgos. Having undertaken extensive renovations in 2017, the second floor has been transformed into a Santorini blue, casually sophisticated oasis. Creative craft cocktails are abundant and their mixologist Shane focuses on flavor and high quality ingredients. Shane thought Michelle looked like a 5 O’Clock Girl, that is, in need of a 5 O’Clock Girl refreshing cocktail of Bombay Sapphire gin, muddled cucumber/cucumber juice, a hint of mint, fresh lime and rose water. Dennis got a kick out of an Orange Street New Fashioned consisting of Bacardi 8 rum, tangy vanilla, Thai chili syrup, orange juice, and cherry foam that infused the drink with a sunset hue. Shane kept up the making and shaking and a third inventive cocktail arrived at the table, Lady in Thyme, with Central Market gin, lemon juice, bee pollen, and egg white, enlivened with thyme simple syrup. This drink was deemed by the two as deliciously sweet and bitter at the same time. The Mediterranean and Greek traditional grilled octopus arrived in harmony with cucumbers, cherry tomatoes, red onions, and jalapeno. “The char is perfect; I wish I had eight arms to eat this,” Dennis said. Michelle recognized that the chef new exactly how to prepare the octopus as it was impressively tender on the inside with crispy surface bits all around, the grill enhancing the flavor of the octopus which she moistened with a lemon garlic vinaigrette. Halved avocado was up scaled with pearly white delicate lump crabmeat folded with olive oil, lime and herbs. Dennis loved his New Fashioned drink paired with the crab avocado and Michelle was dazzled by how fresh this dish tasted, with the avocado ripe but still firm. Dennis and Michelle’s friends from Referral Partners Plus then popped out of the elevator to join in the cocktail and appetizer fun, as the name “Kefi” means good humor in Greek. Two more unique cocktails showed up. A killer Rosemary Grapefruit Old Fashioned, made with Larceny bourbon, muddled grapefruit, house-made rosemary simple syrup, barrel-aged bitters, and a dash of grapefruit bitters reminded one of us at the table of a recent trip to bourbon country in Kentucky. Another specialty cocktail, Katzivieri, a drink made with Ouzo, Grey Goose Vodka and San Pellegrino blood orange, is Kefi’s homage to the common Screwdriver. As Kefi prides itself on its top-quality meats and seafood, the crew was served entrees of lamb chops and Chilean sea bass. Highlighting that use of superior ingredients and preparation, a simple essence of olive oil, fresh oregano and lemon delivered the classic Paidakia, charbroiled single cut lamb rib chops. All formalities aside, Dennis could not help himself but to pick up the lamb chops with his bare hands and eat the meat right of the bones. 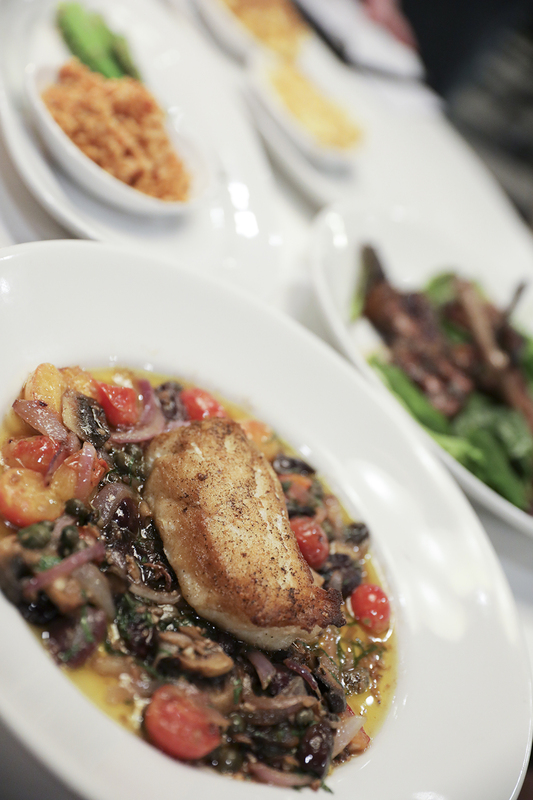 The buttery flavor of the dense white Chilean sea bass stood up to the Provencal style of sautéed mushrooms, grape tomatoes, capers, Kalamata olives, garlic, and white wine. “This fish dish is delish,” exclaimed Dennis. These entrees were complemented by a comforting reassurance of rice pilaf, creamed corn, baked mac and cheese, and steamed asparagus. In addition to the modern renovations that were completed for the new restaurant on Yorgos second floor, the pub was updated and a third floor cocktail lounge and rooftop deck were installed. Dennis and Michelle agreed that when coming back (and they will come back), they plan to rediscover Yorgos all over again but with all three experiences on all three floors in one night.